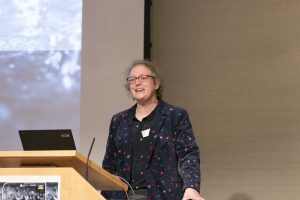 Several members of the DARE team were involved in the NERC Flooding from Intense Rainfall (FFIR) programme open event, held at the Royal Society in London on 27 November 2018. Dr Linda Speight, FFIR Policy and Impact officer wrote this overview of the event. Over 3 million households are at risk of surface water flooding in the UK and this number is set to rise in the future. Surface water flood events happen quickly and affect small areas, the surrounding region may not see any rainfall at all. This makes them difficult to forecast. Through the NERC funded Flooding from Intense Rainfall programme (FFIR), meteorologists, hydrologists, scientists, consultants and operational experts are working together to reduce the risks of damage and loss of life caused by surface water and flash floods. The research includes everything from historic newspaper archives to drones and high speed computers. It has identified places vulnerable to flash flooding, developed new techniques for monitoring rivers during flood events, improved weather forecasts for intense rainfall and demonstrated the potential for real time simulation of floods in urban areas. Importantly the five year programme has helped improve communication between people in the hydrology and meteorological research communities. This will have lasting benefits into the future. 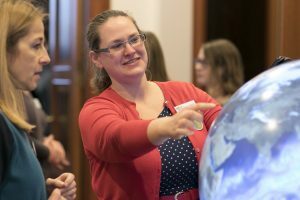 At the programme showcase event at the Royal Society in November 2018 there was a hands on opportunity to interact with the challenges of flooding from intense rainfall. Alongside presentations and an expert panel debate, participants could immerse themselves in a virtual reality simulation of a flash flood, watch convective rainfall develop on a giant forecast globe and share their thoughts on the modelling and communication chains that underpin flood forecasting. Forty days and forty nights of rain. I thought about days of sustained rainfall. Could ever be bound to our arid past. The conditioning of least-squares problems in variational data assimilation. Of closing the floodgates after the horse had bolted. To adapt to our environments. For the cavalry to arrive. Identify locations at risk of flooding. And how this will enable better decision making and communication. But most of all I think about people. Of end-to-end-forecasting, knowledge sharing, and upstream engagement. Histories which can be used to engage local communities.